Autism Month (April) – Chaleur Autism and Asperger Family Centre Inc.
Gearing up for autism awareness month in April. Grateful for the great partnership we have with Bayside KIA, Bathurst. 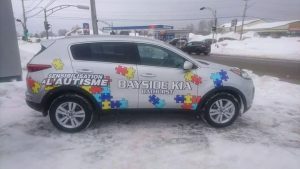 Next time you are driving by their car lot be sure to check out the AWESOME vehicle that is promoting autism awareness. It will also be seen at Titan games and will be featured in our Walk for Autism scheduled for April 29th in Beresford. – Registration begins at 10 am. – Walk will start at 11 am. Leaving from the CAAFC; 970 Main Street, suite 2, Beresford, to then return to the CAAFC. – Walk will be followed by lunch of pizza and drinks. Bring along $ for dinner and for autism awareness items. All monies raised will be used for the programs and activities at the CAAFC. – This is an activity for the whole family!! Hope to see many of you on hand to support the families and the individuals living with ASD.